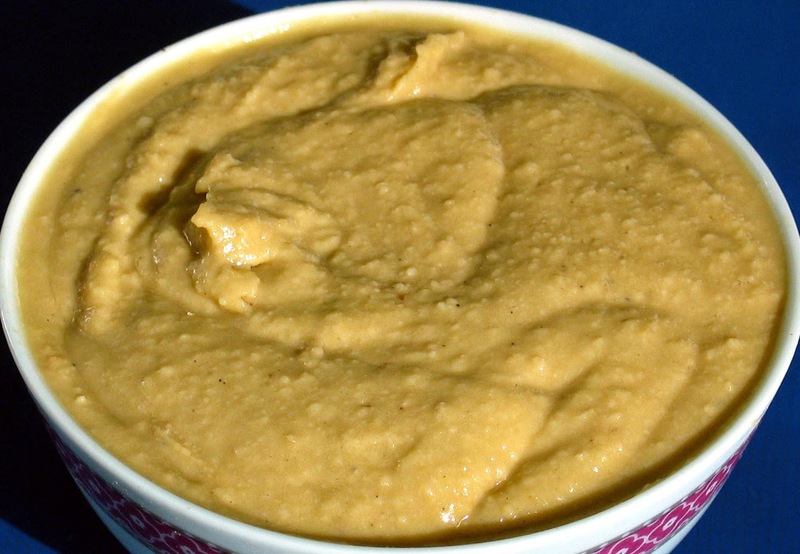 Hummus is a great and healthy spread option for breakfast, or an extra condiment for lunch! It is one of the most famous dips of Levantine origin, and is prepared all over the world. It's so easy to prepare, and lasts for a whole week. The homemade version is always better than the store bought one. Chickpeas - a can or jar of canned chickpeas, approximately 350 grams or 300 grams of fresh chickpeas, boiled for an hour and a half and left in the water overnight. I prefer the canned variety, since they have had a lot more time to soften up in the liquid. Strain the chickpeas into a food processor, and add about 2 tablespoons of the liquid they were boiled or canned in - the liquid is needed to achieve a smooth texture. Peel the garlic and push the cloves between the chickpeas in the food processor. Put in a good large pinch of salt over the chickpeas - adding salt is to taste. I like to add two pinches of salt to counter the sweetness of the tahini. Stir the tahini in the jar because it tends to set to the bottom of the jar. Pour three tablespoons of tahini over the salt, thus capturing the salt and preventing it from flying all around the food processor. Pour the lemon juice over the tahini, and add a tablespoon or two of olive oil. Close the food processor, and blitz everything until you turn the contents into a consistent paste. To get a better smoothness without adding too much liquid, pause the food processor twice for 30 seconds and then continue. This will allow the olive oil and lemon juice to seep in the already broken chickpeas and let them be ground into a finer paste. If you still feel the texture is too coarse, add another one or two tablespoons of the chickpea liquid to the food processor and blitz twice more. Pour the hummus into a container, seal and refrigerate. It will reach it's best flavour after 1 hour of resting when all the flavours are evenly distributed and dissolved. Enjoy a great dip/spread instead of butter or mayo. Final hint - wash the food processor immediately, since the tahini with ground chickpeas is very sticky when dry. If you don't clean it quickly, you'll have a very long and bad time cleaning the dry sticky stuff from the food processor.